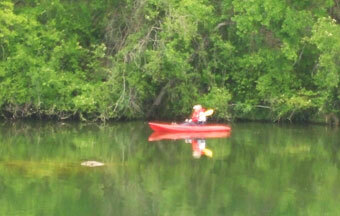 Welcome to Shady Oaks Riverside RV Retreat! One of Texas' Best Kept Secrets! In 1983, God blessed our family with the stewardship of this place we now call Shady Oaks, an RV retreat located in the Highland Lakes area of the beautiful Texas Hill Country. Since then our goal has been to make Shady Oaks a place where one can experience a little piece of heaven in this sometimes-hectic world. As a family, we are committed to providing RV owners an opportunity to get more use and enjoyment from their RV. Traditionally most RV's sit in storage or parked next to their owners' home for much of its life. We provide a gated secure environment for you to park your RV monthly while being able to enjoy it as much as you'd like. Suddenly, instead of just storing your RV you have a year around lakeside retreat. Shady Oaks does not just provide a secure place to park your RV, it also provides an incredible Hill Country experience of abundant wildlife, fishing, kayaking, or canoeing all in one of the most beautiful and peaceful environment that Texas has to offer. All this while you still enjoy the reason you bought your RV, the freedom to take your RV out on the road and travel. Shady Oaks is a gated, secluded country RV retreat located on 23 acres, with 1700 feet of water frontage, just below Inks Dam on the Colorado River. Some of the largest and most beautiful live oak and pecan trees in the Central Texas area, as well as many types of wildflowers, cacti, and shrubs, provide a sanctuary for the abundant wildlife. 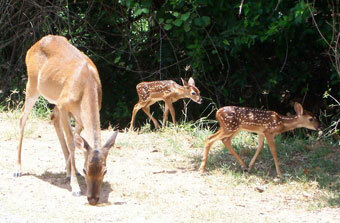 White-tail deer roam freely through the park and birdwatchers will find a wide assortment of species to view. 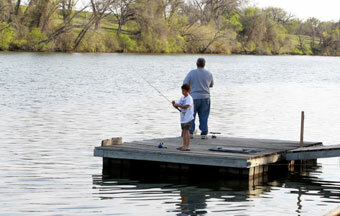 In addition, we are within ten minutes of three of the best fishing and water sports lakes in the Highland Lakes chain: Lake Buchanan, Inks Lake, and Lake LBJ.